Downloaded textures for #1 & #2 via your gallery. caro123 (7 years ago) Inappropriate? Thanks so much. This is gorgeous. I usually don't go for period cloths, but the style and quality is irresistible! Chohole Textures (9 years ago) Inappropriate? ejworks (9 years ago) Inappropriate? What are you using for the hat, gloves, and umbrella? 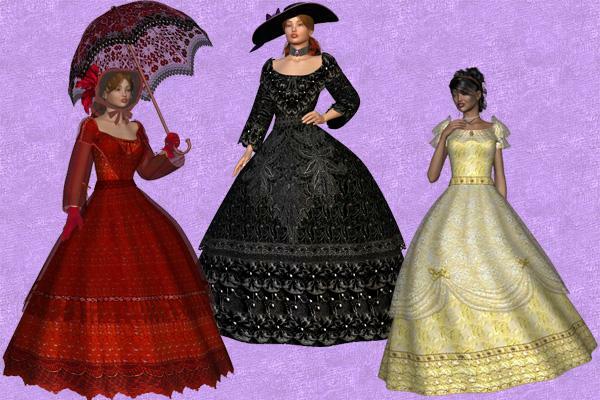 I love these dresses and have used them, but could really use some hats and other goodies to complete the look. Elisha (9 years ago) Inappropriate? TinaW (9 years ago) Inappropriate? You are the texture queen! Thanks for continuing to share your incredible talent with all of us...and for free no less! Thanks to Jan 19 for such a cool dress, too. Cho, thanks for sharing it with us, too.